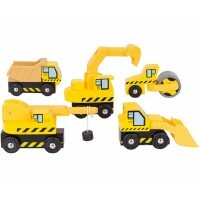 Construction toys mix imagination with learning whilst offering hours of fun to children. Our wooden construction toys will help them put together complete wooden building sites and include fantastic wooden cranes, workmen, wooden bulldozers, toy diggers and dumper trucks. Your little builder will spend hours digging and moving earth and helping the workmen lift heavy equipment. 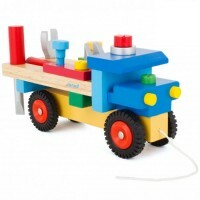 Wooden construction sets encourage experimentation and help children begin to develop their problem solving skills. Children love building their own toys and our selection from leading manufacturers will be a delight for all inquiring and playful minds.